Provence is the name of a firm comprising of a collection of individuals who believe in excellence. We specialize in hiring people who have the drive to succeed and the will to implement the discipline required to succeed. We focus on nurturing our team and providing our team an environment that is conductive to creative thought. We focus on eliminating stress and pressure so our team can think clearly and creatively. Founded in 1998. Re-Established in 2016. Provence was founded in 1998 in Fair Oaks, California where it remained for the first few years as a (very) small agency. In 2001 we moved to Sacramento, until finally moving Elk Grove, our permanent home since 2006. We remained a single location organization with a team of 4 to 6 people until about 2016. Today Provence is one of the fastest growing insurance agencies in the west, with a team of 30 incredible people. To become a top 100 Insurance firm in the country in the country. Plain. Simple. How fast are we growing? Between January 1st 2017 to January 1st 2019. We doubled the number of states we have physical locations in, quadrupled our revenue, quintupled our team size and sextupled our number of locations. And we are just getting started. When you work at Provence, you get to be part of a team that is known for its performance. We are efficiency driven professionals who focus on the single goal of becoming one of the largest and best insurance firms around. Provence focuses not just on recruiting individuals that are performance oriented but also on developing them. To us it is important to ensure that our clients are satisfied and are being served with the care and respect they deserve. We specialize in insurance many financial services. Once we see the potential in someone and recruit them we ensure that they get an environment in which they can actually realize their potential. As a firm that has grown over 100% in many recent years, we are always on the lookout for team members who are looking to further their career. Some other great reasons to consider us. We are a premiere Nationwide Insurance partner. We have a seat on the Nationwide Regional Agency Council Board and the Nationwide National Agency Council Board. Two weeks paid vacation time after one year of service. We care for our clients’ business as our business. We think and act like business partners, not just advisors. We share our clients’ aspirations, work to understand what is important to them, and align our incentives with their objectives — so they know we’re in this together. 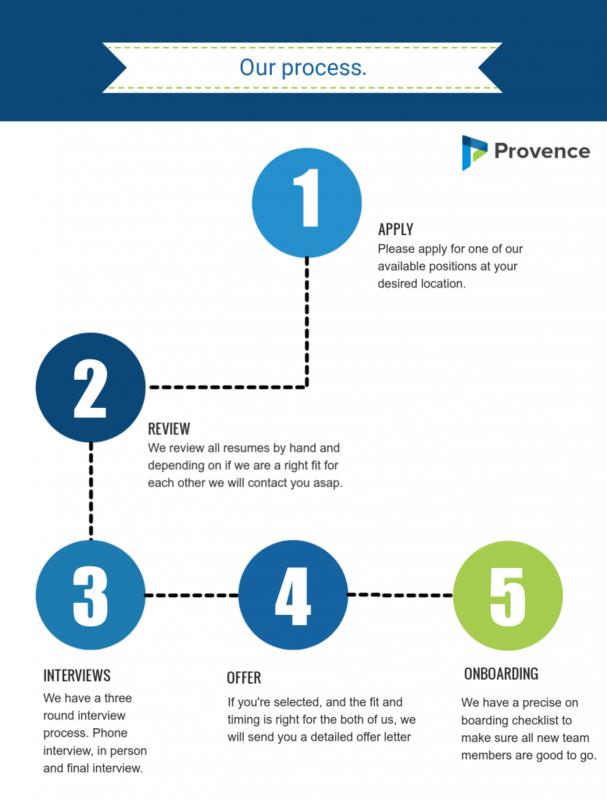 Personal impact, mentoring, and teamwork are just a few of the benefits of building a career at Provence Group. Contact us to learn more about what we offer.